to learn all about “The ABC’s of a Successful Author/ Illustrator Visit.” Information about finding sources to fund school visits can be found on this site. I would be delighted to come to your school and share my love of children’s books with your students. My goal is to inspire students to get excited about reading and writing. I like to compare how I write to how students write. We are all working hard to create an interesting story for our readers. I usually talk about my life as a writer, how I got started, the writing process, how ideas are generated, and tips to improve writing. I often use a Powerpoint presentation along with visual items, such as rough drafts, illustrators’ sketches, galleys, and lots of editors’ rejection letters. My rejection letters let students know that real writers experience failures and frustrations but keep on working and rewriting until they get it right. I might share a newspaper I wrote at age 10 which later inspired The Best Bet Gazette, or my first handwritten, cloth bound book titled The Strange Land. It is always a good idea for students to become familiar with at least one book before I arrive. This way the presentation will have more meaning for them and they will come better prepared with questions. Either students should have a chance to read a book themselves, or they should have one read to them by teacher or librarian. Students should be grouped by grade level. Since I use a Powerpoint presentation for most of my programs, it is best to limit the audience to 100 students or less at a time. This also allows for better group interaction. 40 – 50 minutes, depending upon grade level. Time for questions and answers is included. I will give up to 3 presentations per day. $450 One day (up to three 40-50 minute programs) I am available for areas within a 50 mile radius of Richmond, TX. Richmond is just southwest of Houston, near Sugar Land. $150 One 40-50 minute program, available for libraries, schools, and other groups in the Rosenberg/ Sugar Land area only. 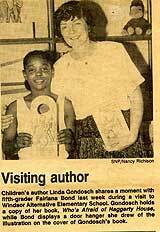 How did I go from Mrs. Newport's 2nd grade class to becoming an author of ten books? How can students become better writers? WHERE DOES A WRITER FIND IDEAS FOR STORIES? How do I get ideas for my books? How can student writers get ideas for their stories? How can students make their writing stronger using sensory language, strong verbs, dialogue, word pictures, and more? How can students improve their writing by revising and rewriting? How can writers jump start their stories with "What if?" questions? What does a writer need to build a great story? How did I develop the plot, conflict, characters and setting of Camp Kickapoo or Brutus the Wonder Poodle? How does a book evolve through stages of thinking, planning, writing, revising, and editing? How does a writer work with an editor and illustrator? Why did Thomas Jefferson send Meriwether Lewis and William Clark into the uncharted lands of the American West in 1804? What incredible adventures did the Corps of Discovery experience as they explored Louisiana Territory and Oregon Country? Why was the Boston Tea Party of 1773 a turning point in American history? What exciting events led to the American Revolution? How did I write Where Did Sacagawea Join the Corps of Discovery? And Other Questions about the Lewis and Clark Expedition? How can students research and write nonfiction reports for school? Who was Junípero Serra, the Franciscan friar who opened the first California missions that became the cities of San Francisco, San Diego, and others? I would be happy to sign books on the day of my visit, either before school, between sessions, or after school. 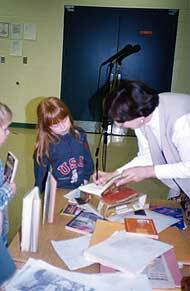 I prefer to meet and greet each student as I sign his/her book, but time does not always allow for this. 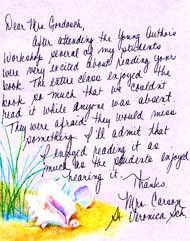 It is a great help to have a slip of paper in each book with instructions on what to inscribe. A fourth book, CAMP KICKAPOO (fiction), is out of print, but still available through the author.